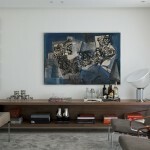 Diego Revollo is one of the prominent designers of interior architecture and decoration in Brazil. The architect uses classical elements as anyone in contemporary projects. He has started his career working beside masters and today he has his own office in São Paulo. also in South America. He also works as advisor of magazines specialized in architecture and decoration. This apartment of 350 square meters, located in São Paulo, was designed for a young couple with two children and concluded in 2010. The project proposal was based on the characteristics of the owners, who sought modernist references to your new residence. From the beginning, the premise requested by the customers was to have coziness and comfort. Thus, the wood was used in order to warm the environments and to provide a contrasted with the marble floor. Neutral and warm tones, like gray, beige and brown, and the upholstered furniture received priority in the composition with the goal of make the space more enjoyable. Simple shapes and straight lines, blended with contemporary elements such as some Italian furniture and works of art, creates a harmonious composition. The pieces of design make even more evident the vanguard used as the basis, referring to the Modern Architecture. In contrast to this solid base, appear extremely delicate elements like the seventies ceiling lights and lampshade that provide more refinement to the apartment. One of the biggest challenges was the integration of the hall with the Living. After some changes in the masonry, were installed doors and panels that can be modulate according to necessity. The door of the lavatory can be disguised and the main doors can be open to form a unit with the panels of the hall.